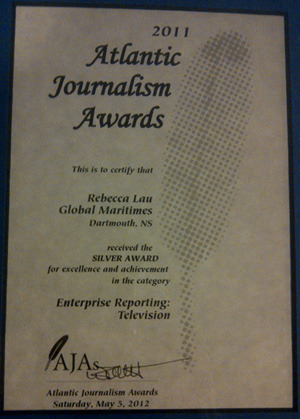 Our Atlantic organ donation story bagged an award at the Atlantic Journalism Awards in Fredericton Saturday. The story itself was based on a map package using the first three characters of the postal codes of registered organ donors in Nova Scotia and New Brunswick, which showed a lot of local variation. Nova Scotia does better than New Brunswick for organ donation, but New Brunswick does better than other provinces like Ontario and British Columbia. We’ve sent a number of data stories east to Halifax, including Nova Scotia and New Brunswick drunk driving data and seasonal changes in fertility in Nova Scotia (and Ontario, Alberta and BC – they’re very similar). The story itself was based on a map package using the first three characters of the postal codes of registered organ donors in Nova Scotia and New Brunswick, which showed a lot of local variation. We’ve sent a number of data stories east to Halifax, including Nova Scotia and New Brunswick drunk driving data and seasonal changes in fertility in Nova Scotia.